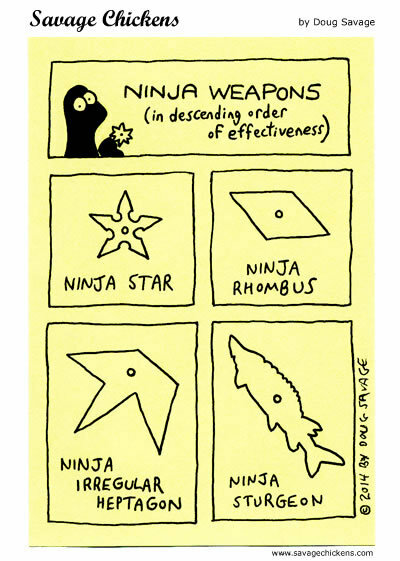 I’d like to add something to my roundup up of last week’s mathematically-themed comic strips. That thing is a reminder that I’m hosting this month’s Playful Mathematics Education Carnival. It’ll post the last week of September. If you’ve recently seen pages that teach, that play games, that show any kind of mathematics that makes you smile, please, let me know. It’s worth sharing with more people. 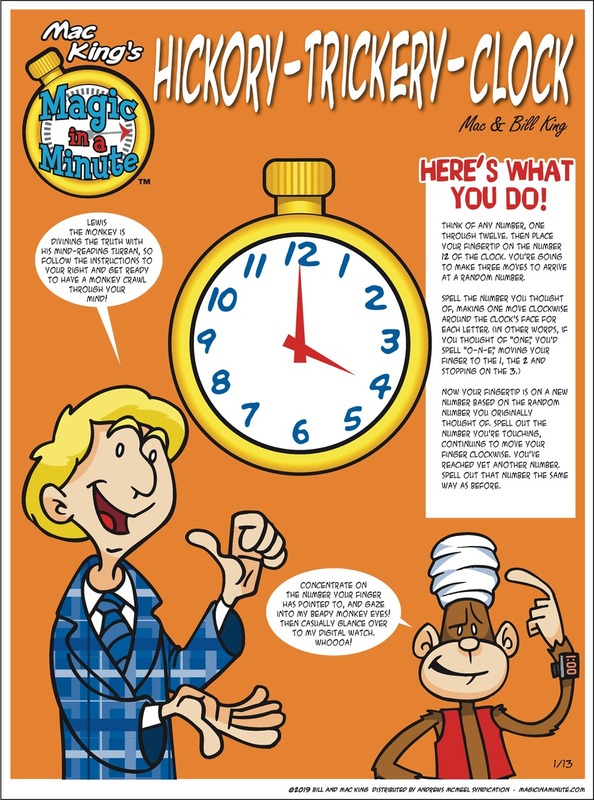 Tom Gammill’s The Doozies for the 6th is the Venn Diagrams joke for the week. 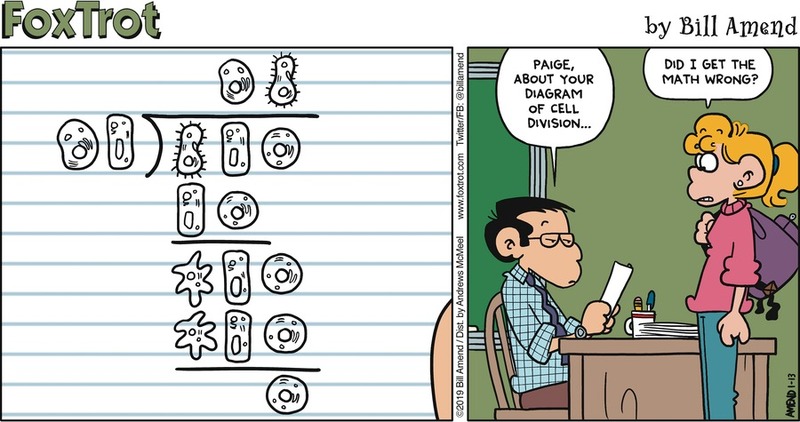 It’s only a two-circle diagram, but the comic strip hasn’t got that large a cast. And, really, would be hard to stage in a way that made the joke communicable with three or four participants. Tom Gammill’s The Doozies for the 6th of September, 2018. It wasn’t until transcribing the strip for the image mouseover text that I noticed the second panel had thought balloons rather than speech balloons. I’m not sure what’s contributed to the joke by their being thought rather than speech balloons. Phil Dunlap’s Ink Pen rerun for the 7th showcases arithmetic as a putative superpower. I would agree with Dynaman that at least this addition doesn’t show off superpowers. But there are feats of arithmetic that do seem superhuman. Mathematical pop histories often mention people who could do quite complicated calculations in their head. Some of them were also great mathematicians, like Carl Friedrich Gauss, Leonhard Euler, or Srinivasa Ramanujan. Some were just … very good at calculating. Zacharias Dase is a famous 19th century example. He’s reported as having been able to multiply together two hundred-digit numbers, in his head. The process took nine hours. Phil Dunlap’s Ink Pen rerun for the 7th of September, 2018. It originally ran the 30th of September, 2011. Is that superhuman? Well, obviously, literally not. But it’s beyond what most of us could imagine doing. I admit I can’t imagine keeping anything straight in my head for nine hours. But. 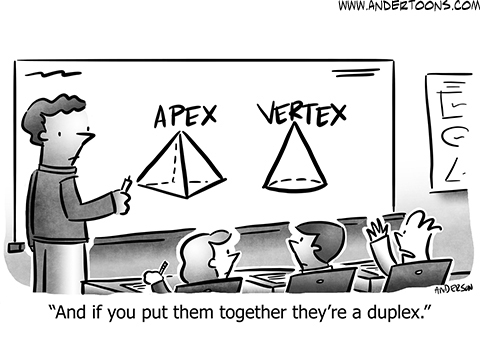 The basic rules of addition aren’t that exotic. Even a process like finding square roots can be done as additions and divisions and multiplications. Much of what makes this look hard is memory. How do you keep track of a hundred or so partial results each of a hundred or so digits? Much of what else is hard is persistence. How do you keep going after the seventh hour of this? And both are traits that you can develop, and practice, and at least get a little better on. Or bypass the hard work. If asked 235 plus 747 I’d at least answer “a bit under a thousand”, which isn’t bad for an instant answer. 235 is a little under 250; 747 a little under 750; and 250 plus 750 is easy. Rewrite 235 as 250 – 15, and 747 as 750 – 3, and you have this: 235 + 747 is 250 + 750 – 15 – 3. So that’s 1000 minus 18. 982, pretty attainable. This takes practice. It amounts to learning how to spot an easy problem that looks like the question you actually have. Greg Evans’s Luann Againn for the 7th of September, 2018. It originally ran the 7th of September, 1990. Greg Evans’s Luann Againn for the 7th shows a date living up to its potential as a fiasco. But it’s not a surprise Gunther finds himself comfortable talking trigonometry. The subject is not one that most people find cozy. I’d guess most people on introduction see it as some weird hybrid that fuses the impenetrable diagrams of geometry with the baffling formulas of algebra. But there’s comfort in it, especially to a particular personality type. There are a lot of obscure things making up trigonometry. But there’s this beauty, too. All the basic trigonometry functions are tied together in neat little pairs and triplets. Formulas connect the properties of an angle with those of its half and its double. There’s a great many identities, particular calculations that have the same value for every angle. You can say that about anything, of course. Any topic humans study has endless fascination. What makes mathematical fields comfortable? For one, that they promise this certain knowability. Trigonometry has a jillion definitions and rules and identities and all that. But that means you have a great many things of absolute reliability. They offer this certainty that even “hard” sciences like physics don’t have. Far more security than you see with the difficult sciences, like biology or sociology. And true dependability, compared to the mystifying and obscure rules of interacting with other humans. If you don’t feel you know how to be with people, and don’t feel like you could ever learn, a cosecant is at least something you can master. I tag my Reading the Comics postsso that you can find as many of them as you like at this link. As long as I’ve written as many as you like. Essays in which I mention The Doozies are at this link. Or will be; turns out this is a new tag. Huh. Essays that discuss Ink Pen are at this link. And essays which mention Luann , either current or vintage, are at this link. Thanks for reading whatever you do enjoy. 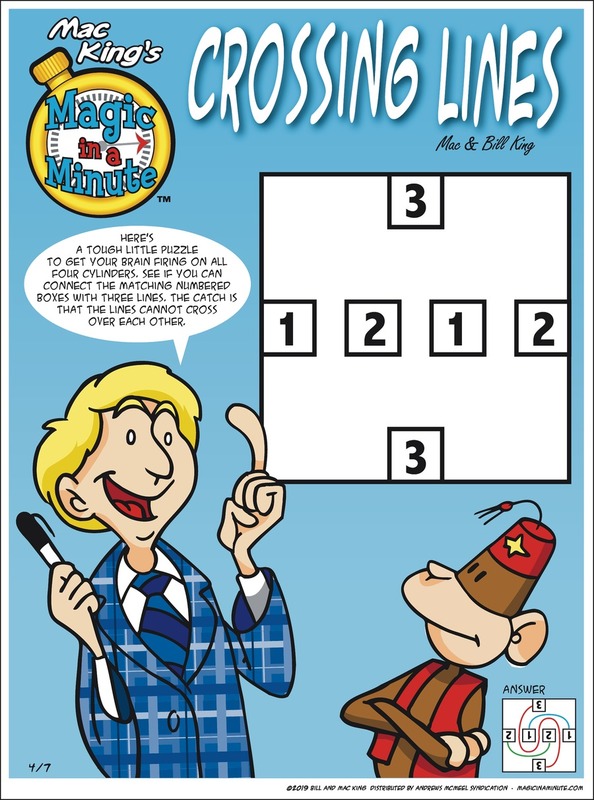 So Mark Anderson’s Andertoons has been missing from the list of mathematically-themed the last couple weeks. Don’t think I haven’t been worried about that. But it’s finally given another on-topic-enough strip and I’m not going to include it here. I’ve had a terrible week and I’m going to use the comics we got in last week slowly. Hector D Cantu and Carlos Castellanos’s Baldo for the 10th of December uses algebra as the type for homework you’d need help with. It reads plausibly enough to me, at least so far as I remember learning algebra. 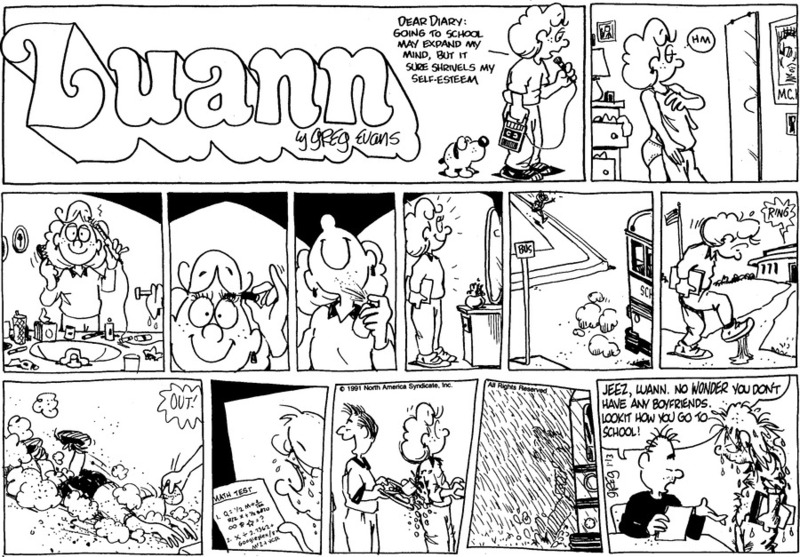 Greg Evans’s Luann Againn for the 10th reprints the strip of the 10th of December, 1989. And as often happens, mathematics is put up as the stuff that’s too hard to really do. The expressions put up don’t quite parse; there’s nothing to solve. But that’s fair enough for a panicked brain. To not recognize what the problem even is makes it rather hard to solve. Ruben Bolling’s Super-Fun-Pak Comix for the 10th is an installation of Quantum Mechanic, playing on the most fun example of non-commutative processes I know. That’s the uncertainty principle, which expresses itself as pairs of quantities that can’t be precisely measured simultaneously. There are less esoteric kinds of non-commutative processes. Like, rotating something 90 degrees along a horizontal and then along a vertical axis will turn stuff different from 90 degrees vertical and then horizontal. But that’s too easy to understand to capture the imagination, at least until you’re as smart as an adult and as thoughtful as a child. Maria Scrivan’s Half Full for the 11th features Albert Einstein and one of the few equations that everybody knows. So that’s something. Jeff Stahler’s Moderately Confused for the 11th features the classic blackboard full of equations, this time to explain why Christmas lights wouldn’t work. There is proper mathematics in lights not working. It’s that electrical-engineering work about the flow of electricity. The problem is, typically, a broken or loose bulb. Maybe a burnt-out fuse, although I have never fixed a Christmas lights problem by replacing the fuse. It’s just something to do so you can feel like you’ve taken action before screaming in rage and throwing the lights out onto the front porch. More interesting to me is the mathematics of strands getting tangled. The idea — a foldable thread, marked at regular intervals by points that can hook together — seems trivially simple. But it can give insight into how long molecules, particularly proteins, will fold together. It may help someone frustrated to ponder that their light strands are knotted for the same reasons life can exist. But I’m not sure it ever does.